Previously we have learned about French Food & Beverage Service Style. Today we will learn about American F & B Service Style. American Food & Beverage style service is considered as the most widely applied service especially in US. The service nature can be both simple and complex. American service is also termed as plated service. The service procedure of American service can vary from formal to casual dining and less formal than French, Russian, or English service. This service is perfect for those who want a rapid and filling meal at a casual restaurant with plain service. Like, Russian service, American service is the quick and requires less least labor-intensive service and little space. American service is followed at diner or family-style restaurant, coffee shops, a counter where casual tableware and placemats are considered as the standard and self-serve bars and salad bars are provided. 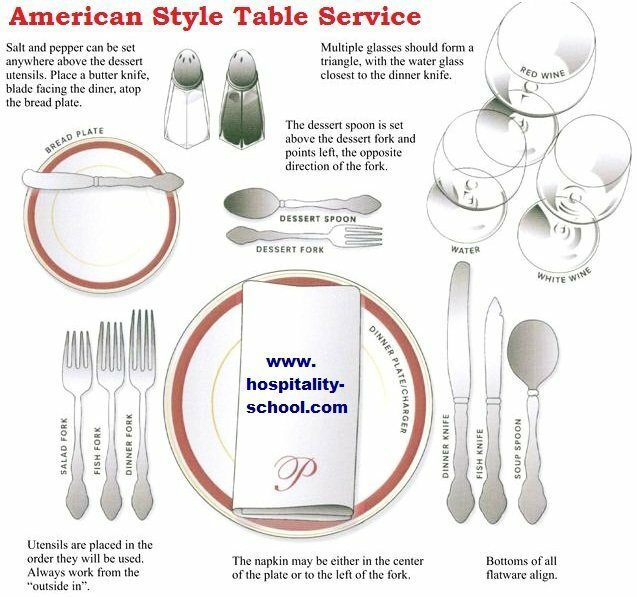 Pre-plating and pre-setting of tables must be done in case of American service with silverware needed during the meal. The preparation of food is completed in the kitchen except for the salad and the bread and butter are bought to the guests ensuring fast service. In American service, hot food is served hot and cold food is served cold. This service requires fewer dishes for service since most of the food of the meal is served and garnished on one plate, hence, the usage of dishes and ware washing costs are decreased. American service is basically preferred by the chefs, because this service allows them to show their creativity by organizing individual food items in an eye catching and appealing style. American service can be personalized according to the situations, such as breakfast, lunch, or dinner service. 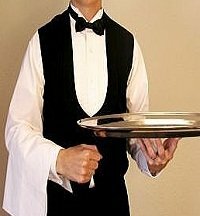 This service requires only one server to serve the meal but with an experienced serving skill. However, this service also ensures the involvement of only one server in one area (for example: back server for picking up the food and the front server for fulfilling guests’ special requests). Table setting for breakfast and lunch differs from the dinner setting. For instance: Breakfast and lunch are simple meals and employ the use of limited amount of serviceware whereas dinner includes more courses and more serviceware. At least fifteen covers are placed on the table for a dinner using American service but not more than twenty-five. Knife is placed with blade facing inward and spoons and forks are placed on the right and left side respectively or according to the nature of the meal. The teaspoon is put on the outside and the soup spoon is placed next to it. The number of flatware could vary according to the menu, but not more than three on either side. If more needed, they are brought at the time the foods are served. The tips of handles of flatware are to be kept about a half inch from the table edge. A service plate or hors d’oeuvre plate may be included on the table setting. A bread and butter plate is usually placed above the forks and sometimes slightly to the left side. In some Up-market restaurants a show plate is served in front of the guest and the food plate is placed on top of it. The butter knife is positioned on the bread and butter plate keeping at a right angle or parallel to the forks. The water glass or goblet is placed where glasses are placed above the spoons and dinner knife and the wine glasses are positioned left side of the water goblet. 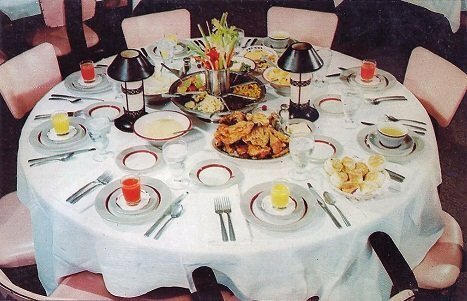 Ashtrays, salt and pepper shakers, and decorations are placed in the center of the table or against the wall in a booth. The coffee cup and saucer are served on the table just to the right and slightly above the knife and spoons. In American service, coffee is sometimes served with the meal. Some fine dining establishments do not allow placing the coffee cup and saucer during table setting, these items are usually placed on the table just before serving the coffee. Cream and sugar are bought to the table either at the beginning of the meal or with coffee. Clean folded napkins are provided and placed in the center of the cover in front of the guest. Chairs are to be out from the table away from the tablecloth, if 1 is used. The table is usually covered with a tablecloth. Servers serve all food items from the left side of the guest using the left hand, and serve beverages from the right side of the guests using the right hand. Other items such as: salads, bread, butter or margarine are also served following same manner as for serving beverages. In informal occasions, bread is served in a basket, but in formal occasions the server serve bread using tongs to place the bread on plates and a fork to serve the butter or margarine. Sometimes butter is also served on a small plate. For larger dining, a number of bread baskets are served along with several plates of butter or margarine according to the numbers of guests. Servers clear the table and collect the soiled dishes from the right hand side when guests have finished their all dishes. Sometimes waiters also crumb the table before serving the dessert. I’m a hospitality management student at University of Cape Coast. I need more knowledge and skills in my field of study. I want to learn it because I also doing f & b service diploma and throw your content I must improve my knowledge.. So help me for this opportunity as soon as possible.